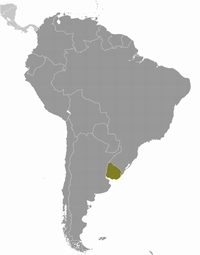 Historische Estancias, verträumte Kolonialstädte, kilometerlange weiße Strände, entlegene Lagunen, Ausritte mit Gauchos, das moderne Montevideo, das mondäne Punta del Este, pulsierendes Nachtleben, endlose Pampa, fantastische Weine, luxuriöse Yachten, urtümliche Fischerdörfer und vor allem Rinder, Rinder, Rinder. Dieser Reiseführer zeigt, dass Uruguay weit mehr ist als nur das kleine Land irgendwo zwischen Argentinien und Brasilien oder die "Schweiz Lateinamerikas". Er thematisiert die einzigartigen touristischen und historischen Attraktionen des Landes genauso wie Begegnungen mit seinen außergewöhnlich freundlichen Menschen und seine kulinarische Vielfalt, die die Traditionen Lateinamerikas und Europas in sich vereint. Fazit des Autors: Es gibt kein anderes Land in Lateinamerika, in dem man auf so kleinem Raum so viel erleben, unternehmen und genießen kann - und dabei so sicher und entspannt ist. Bradt's Uruguay, the only dedicated English-language guide to this country that's small yet bursting with character, shows that the adventurous tourist can uncover much more. It provides in-depth coverage of the capital Montevideo, where the colonial Old City is being restored. There's also detailed information on the coastal city of Colonia (which is on UNESCO's World Heritage List) as well as Punta del Este, to whose beaches the Buenos Aires beautiful crowd flocks each summer. Stroll around the World Heritage Site Colonia del Sacramento and you will feel like you have travelled back in time: 17th colonial buildings grace the historic section, while the lively modern town extends around a bay. Go by horseback across the country's rolling hills and stay overnight at a country estate. From historic gems to thermal springs, from charming riverside towns to gorgeous beach resorts: Uruguay is ideal for adventurous and leisurely visitors alike. Footprintfocus Uruguay also features detailed coverage of Buenos Aires, the main gateway to the country, plus comprehensive listings on where to eat, sleep and have fun. Essentials section with practical advice on getting there and around. Covers Buenos Aires, the main gateway to the country. Highlights map of Uruguay and Buenos Aires so you know what not to miss. Detailed street maps for Montevideo, Buenos Aires and other important towns. Slim enough to fit in your pocket. This is our fourth version of the country map: this edition updates information and changes the database language to a more modern version, giving greater clarity to the line work and emphasizing place names. 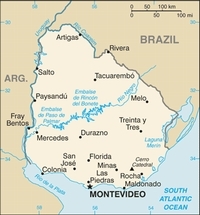 The Montevideo map on the reverse side has been updated, and inset maps of Colonia and Punta del Este have been added.